Three new reviews for today, two recent atmospheric ECM releases and this week’s new Mostly Other People Do the Killing album, which starts us off. 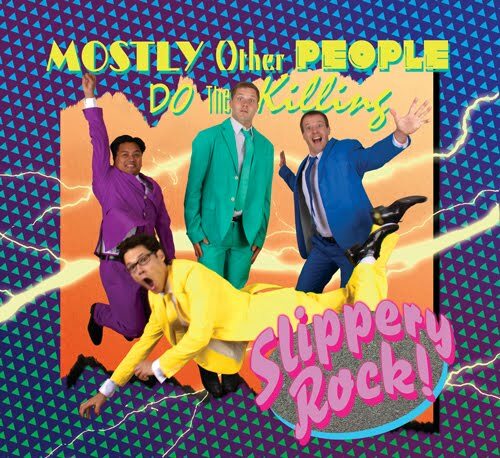 Mostly Other People Do the Killing, Slippery Rock: Mostly Other People Do the Killing (hereafter either referred to as MOPDTK or not at all) describes itself as a ‘terrorist bebop band’ and I can think of no better description of the unique brand of mayhem they create. The quartet headed by bassist and composer Moppa Elliott with Jon Irabagon on sax, Peter Evans on trumpet and Kevin Shea on drums, gleefully tackles traditional styles with wacky irreverence, tearing them apart and building them back up in a collage of squeals, swing and funk. You can see what their attitude towards tradition is even from their album covers, which are sendoffs of classic albums: last time was a live album, The Coimbra Concert styled on Keith Jarrett’s Koln Concert and the time before that Forty Fort styled after Roy Haynes’ classic Out of the Afternoon. If I don’t know what Slippery Rock’s cover spoofs (I assume the tradition has continued) it’s probably because this time around Elliott has chosen to tackle smooth jazz. Yes, I said smooth jazz, but don’t worry, MOPDTK’s sound is exactly the same as it has always been, full of swinging chaos. Rather, Elliott has (apparently) worked stylistically smooth licks and chord changes into the compositions this time around. If you, like me, don’t listen to a lot of smooth jazz, you probably won’t recognize what that means. You will, however, recognize the skillful group free improvisation while the bass holds down the beat and everyone else goes crazy on top, including drummer Shea playing all over the beat. Each MOPDTK album is a fun, if totally wild, romp. I can think of few other groups that produce so thoroughly enjoyable, although truly bewildering, albums. 4 stars. Eberhard Weber, Resume: Eberhard Weber’s, longtime bassist for Jan Garbarek, new album is a very different sort of affair. Concert’s with Garbarek’s group always included an extended solo improvised bass feature and on Resume Weber returns to recordings of these bass features from shows between 1990 and 2007 and reworks them into their own album. The sound is fleshed out with Weber’s own keyboard work, percussion from Michael DiPasqua and by Jan Garbarek himself on a handful of tracks. It’s a fascinating concept for an album and it occasionally shows flashes of brilliance, but I can’t help but feel it let me down. A big part of the problem for me is the synth work, which is at times simply tacky. Then too I think that some of the ‘compositions’ are a bit weak to support all the stuff layered on top of them, not a whole lot of harmonic movement, and that as an album it suffers from the fact that the tracks all sound so similar. The concept is intriguing, but it’s hard for me to imagine coming back to Resume all that often. 2 Stars. Food, Mercurial Balm: Food’s, a collective saxophonist Ian Bellamy and drummer Thomas Stronen, new album is in a similar vein with Resume, though fairs better, if only barely. Mercurial Balm is a highly atmospheric affair and both Bellamy and Stronen double on electronics as do the two guitarists who also contributed to the album. There are also guest appearances by trumpeter Nils Petter Molvaer and by Indian vocalist and slide guitarist Prakash Sontakke. If this is beginning to sound a bit new age, it should, that is Mercurial Balm’s great failing, and the track with Sontakke is the greatest offender. And yet, on the few occasions when they really start to get going (see the track ‘Astral’) it can be strangely compelling. The focus here isn’t the saxophone, which never really digs in, but the drums and guitar backing which build up what might even be called a groove. Not the most engaging album ever made, but with a redeeming feature or two. 2 1/2 stars.